I bought this fabric at the Stoffenspektakel. There was only a 2 metre piece left, and I hemmed and hawed for a couple years before deciding on a pattern for it. 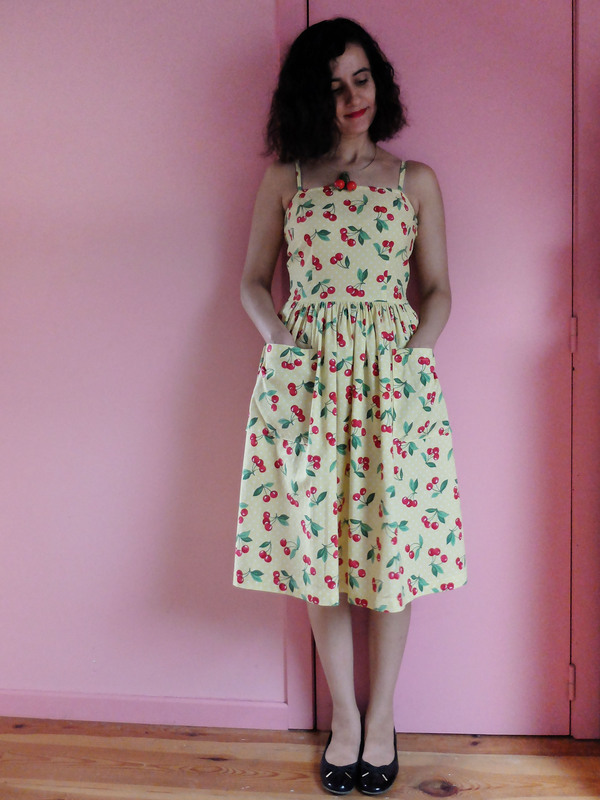 But after making my flamingo dress, also from a small yardage, I immediately knew I had to use the same pattern for this cherry fabric, Woman W88 (a vintage pattern I bought on Etsy). The pattern actually uses quite a lot of fabric, but I’ve only been using the bodice and strap pieces, substituting a gathered skirt the width of my fabric (x2) for the voluminous skirt of the pattern. I’m definitely planning on using the skirt of the pattern in the future, but this substitution has proven very useful when dealing with smaller yardages. I did not make a lot of changes compared to my first version, only tiny modifications. First, I finished the neckline with a narrower bias tape. I’m not sure this was such a good idea. It looks good, yes, and I was able to topstitch it in place instead of slip stitching it, but it also means that I had to cut the hidden ends of the straps way shorter (thus more prone to fraying) than on my first version. I also didn’t add the cute little strap bows this time. I felt one dress with these bows was enough, and I didn’t want it to be too obvious that I had two dresses that were exactly the same but for the fabric. For the same reason, I changed the shape of the pockets, too, from rounded to square. One small fit problem I hadn’t noticed on my first version is that the waistline is maybe a touch too low. Another small fit problem I hadn’t noticed on my first version, probably because it was hidden by the bows, is that the two front neckline darts do not sit perfectly flush to my body. It’s barely visible (even less in the pictures), but a possible improvement to keep in mind for a future version. Because there will be future versions of course. It’s the kind of pattern I can see myself sewing over and over again, changing only the fabric and small details. I love it so much that I almost didn’t dare starting to wear it! I finished it about ten days before my travel to Spain, so I decided to save it for the travel and didn’t wear it before we left. Once in Spain, we spent a week in Madrid and I didn’t wear it because I wanted to save it for later. Then we arrived at the village where we spent the rest of the holiday… and I didn’t wear it because I felt it was too fancy for the village! So more than a month after finishing it, I hadn’t worn it even once! Which it should, since I made a muslin, but still, I was worried! I rarely make muslins. I know, I know, boo me! But I always check the measurements of the pattern and usually baste the garment together to check and correct the fit before I sew it for real. When in doubt, I also use fabrics that I like, so that I can wear the finished garment if it’s a success, but that I won’t cry over if things don’t work out the way they should. But this fabric, ah, this fabric! I don’t remember where I first saw it, but it was out of stock, so I hunted it down for months (maybe years?) until I came upon it at the late Fabric Rehab. I bought enough to sew a Deer&Doe Belladone, which was what I wanted it for in the first place. 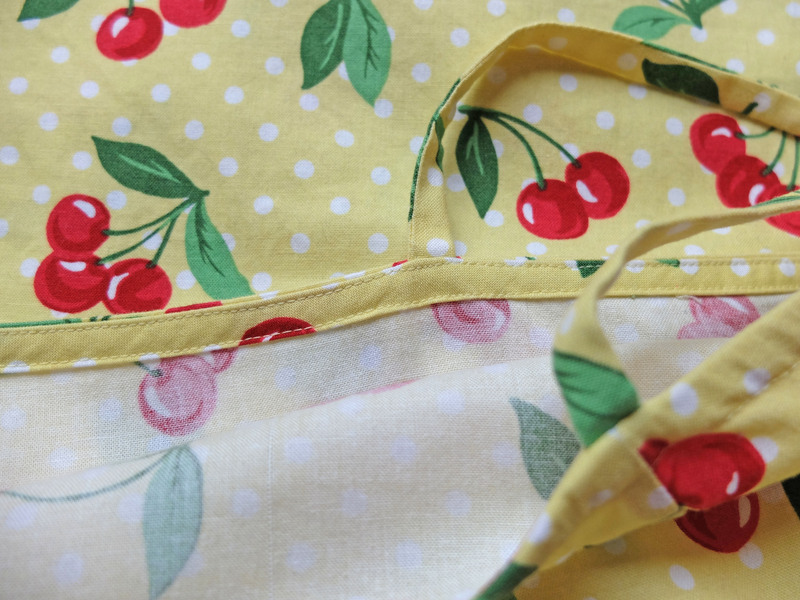 When it arrived I realised it was thinner than what I had expected (I was expecting more of a quilting cotton and it is a poplin), so into the stash it went until I found a pattern that would be worthy of such a dreamy piece of fabric. The pattern I bought on Etsy: it’s a vintage pattern, Woman W388. 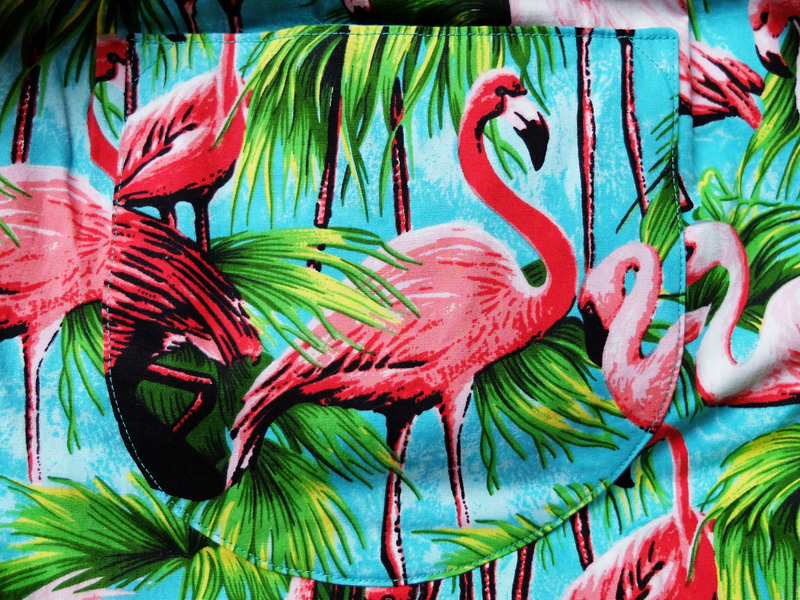 I loved the simplicity of it and thought such a simple silhouette would suit various fabrics from my stash, including and starting with my precious flamingo fabric. I was a bit bewildered when I opened the envelope to see that it was an unprinted pattern: quite surprising since I’d say it dates from the early sixties! But then I thought it would be nice to try my hand at an unprinted pattern for the first time with what seemed to be a pretty easy one. And it was! I soon learned unprinted patterns are in fact no more difficult to use than printed ones. In case you’ve never used one, there are holes of different shapes in lieu of printed markings, that’s all there is to is. There’s a key to which shape means what (notches, darts, grainline…) in the instructions, but you don’t even really need it as it’s intuitive enough to be understood just by looking at the pattern pieces if you’ve ever used any pattern, printed or otherwise, before. So I set out to trace the pieces and sew a muslin of the bodice. This first draft looked horrendous on me! The first obvious problem was that it was much too big. I took off 1 cm at each side seam (4 cm total) and things started to look more promising. I then shaved off between 1 and 1,5 cm from the top of the front piece and between nothing and 1,5 cm from the top of the back piece. I also cut a 2,5 cm wedge off the bottom of the back piece and tadaaa, perfect fit! Okay, maybe not perfect, but as perfect as I can achieve with my meagre fitting knowledge! I’m still debating whether that wedge I took off the bottom of the back piece should have been 2 cm instead of 2,5 cm and have not reached a definite conclusion yet. The pattern has you sew the straps inside the bias binding at the back (which I did) and then adjust the straps at the front and stitch them on top of the bias binding. I didn’t like that so I reopened the binding at the front placement of the straps after I had settled on a strap length and hid the strap ends inside. It’s much cleaner/prettier like that. Another simple deviation from the pattern was the addition of pockets. I hesitated between side seam pockets and patch pockets and opted to use these cute rounded patch pockets I borrowed from a late 1950s robe pattern I had in my stash (McCall’s 4319). I think these pockets look lovely on that dress, so I think I’ve made the right decision. Although I am one of those annoying people who can’t wait for autumn to start, I must say I’m going to be a bit sad to say goodbye to this summer dress for so many months (this might leave me enough time to find a well-fitting strapless bra to wear with it though, who knows? 😉). I am trying to get as much wear as I can out of it while it’s still possible. I once again took the pictures for this blog post coming home from work and this is the outfit I wore that (rainy) day… Minus a cardigan of course! After more than a month without so much as touching my sewing machine, I was itching to get back to sewing, but with the start of the schoolyear I couldn’t for the life of me find the necessary time/energy. That was until last Wednesday, when I had the afternoon free and the apartment to myself, so no more excuses! I opted for a very simple project that could be completed in one afternoon, to get back in the saddle smoothly. 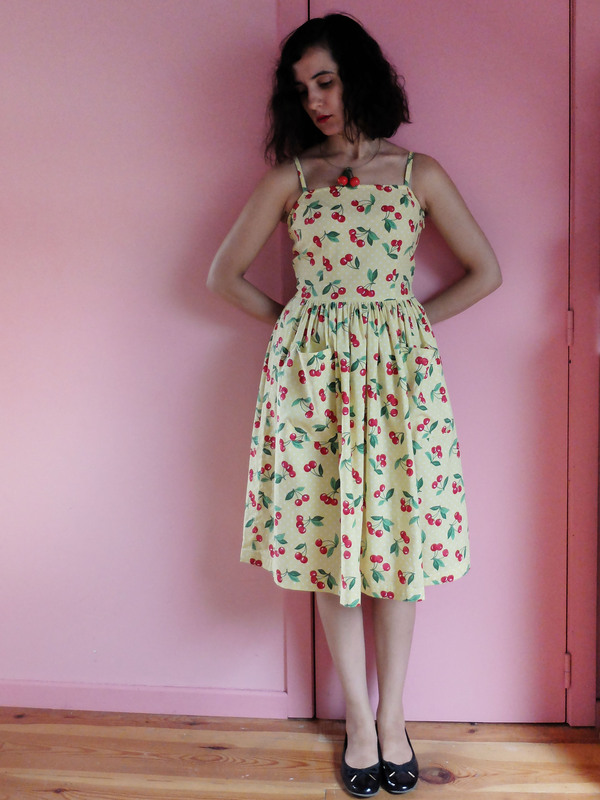 I had that project in the back of my mind since I bought this vintage apple fabric a few months ago. I loved its colours, print and drape, but it’s one of those almost swimsuit-like polyester knits from the seventies, which I thought might look a little tacky as a dress. So I immediately pictured it as a very simple elastic waist gathered skirt. I tried to keep things as simple as possible: I used a whole width of fabric, so there is only one seam at the back and the selvages serve as seam allowances. I however found it pretty difficult to sew the elastic on: even when stretched out to the hilt, it wasn’t long enough to accommodate the width of the fabric. I solved the problem by making a few small pleats where there was excess fabric. Also, the elastic I chose has ruffles up and down, which made it difficult to sew evenly, but it doesn’t really show on the finished garment unless you’re looking for it specifically. 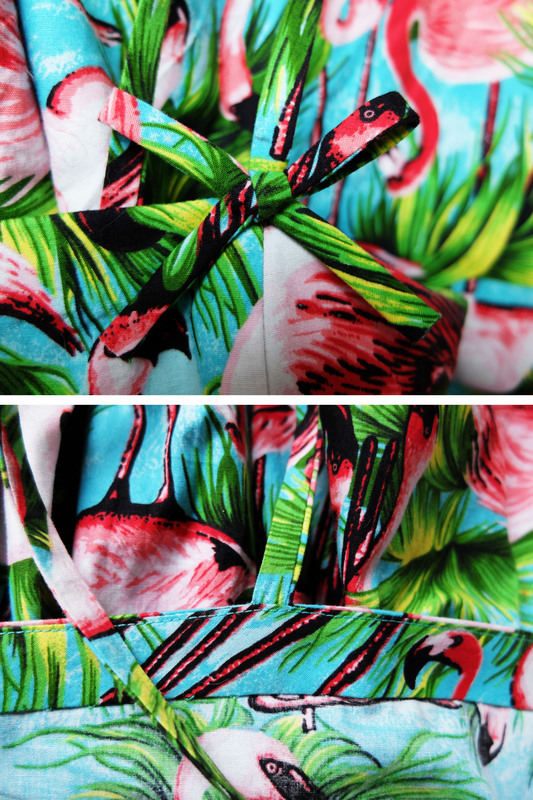 The hem is simply turned up once (the fabric doesn’t unravel) and stitched with a double needle. I debated for a long time whether to keep this length or to chop it off, and finally opted for this more practical one (no risk of flashing anyone when getting on and off my bike! ), which I also found cuter even though it’s possible that it makes me look a little shorter. I figured I could shorten it later if I ever had a change of heart. 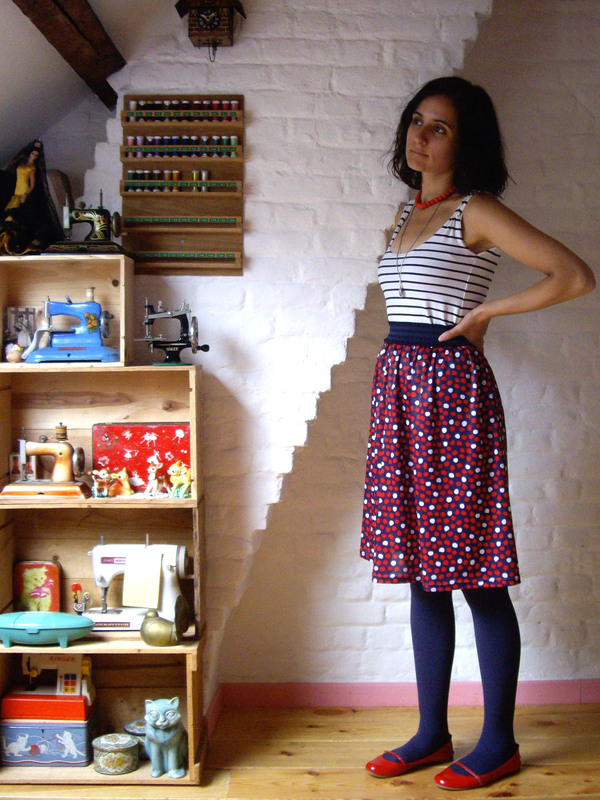 I was so happy to have a finished skirt at the end of the afternoon that I immediately planned an outfit featuring it to wear the next day (i.e. yesterday), which was the one you see in the pictures plus a golden yellow cardigan (and a scarf to keep the cold away!). After wearing it on my bike and at work yesterday, I can now attest to its comfort! 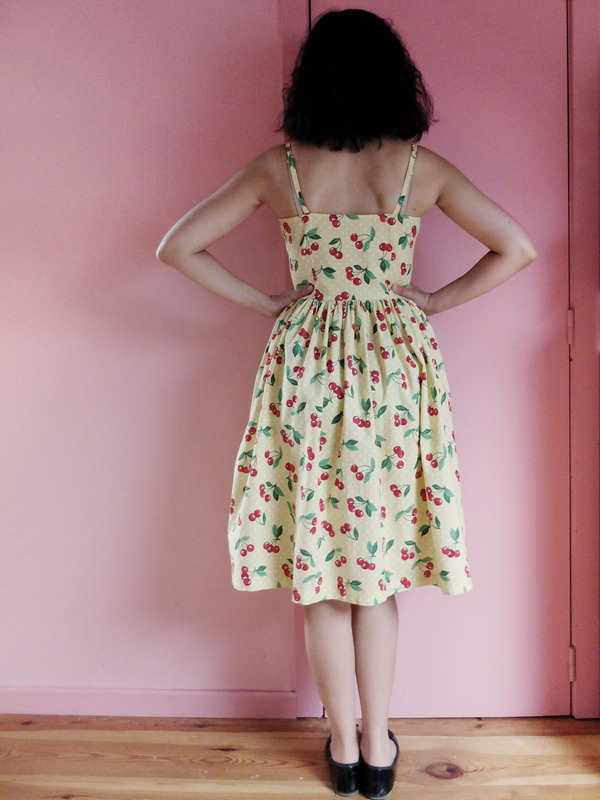 I was afraid a skirt with an elastic waist wouldn’t suit my figure. I’m still not convinced it’s the best choice for someone with such large hips and a short waist, but I think it looks okay anyway and maybe that’s just me being picky… It certainly won’t prevent me from enjoying my new skirt. 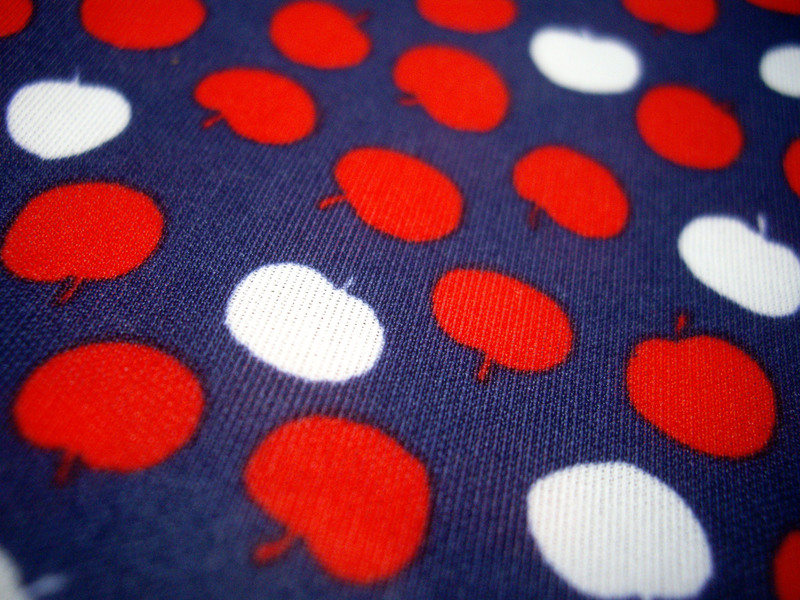 It’s in one of my favourite colour combinations and it has apples on it, what more do I need?